Chasmosaurine ceratopsids are well documented from the Upper Cretaceous (Campanian) Dinosaur Park Formation (DPF) of southern Alberta and Saskatchewan, and include Chasmosaurus belli, Chasmosaurus russelli, Mercuriceratops gemini, Vagaceratops irvinensis, and material possibly referable to Spiclypeus shipporum. In this study, we describe three recently prepared chasmosaurine skulls (CMN 8802, CMN 34829, and TMP 2011.053.0046) from the DPF, and age-equivalent sediments, of Alberta. CMN 8802 and CMN 34829 are both referred to Chasmosaurus sp. based on the size and shape of the preserved parietal fenestrae. TMP 2011.053.0046 is referred to Vagaceratops sp. based on the position and orientation of its preserved epiparietals. Each skull is characterized by the presence of an accessory fenestra in either the squamosal (CMN 8802 and TMP 2011.053.0046) or parietal (CMN 34829). Such fenestrae are common occurrences in chasmosaurine squamosals, but are rare in the parietal portion of the frill. The origin of the fenestrae in these three specimens is unknown, but they do not appear to exhibit evidence of pathology, as has been previously interpreted for the accessory fenestrae in most other chasmosaurine frills. 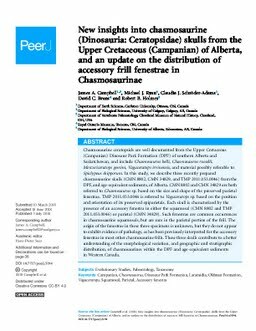 These three skulls contribute to a better understanding of the morphological variation, and geographic and stratigraphic distribution, of chasmosaurines within the DPF and age-equivalent sediments in Western Canada.